Ahmadizad Firozjaei, S., Latifi, A., Khodi, S., Abolmaali, S., Choopani, A. (2015). A Review on Biodegradation of Toxic Organophosphate Compounds. Journal of Applied Biotechnology Reports, 2(2), 215-224. Safar Ali Ahmadizad Firozjaei; Ali Mohammad Latifi; Samaneh Khodi; Shamsozzoha Abolmaali; Ali Choopani. "A Review on Biodegradation of Toxic Organophosphate Compounds". 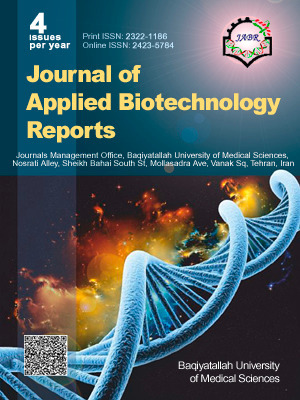 Journal of Applied Biotechnology Reports, 2, 2, 2015, 215-224. Ahmadizad Firozjaei, S., Latifi, A., Khodi, S., Abolmaali, S., Choopani, A. (2015). 'A Review on Biodegradation of Toxic Organophosphate Compounds', Journal of Applied Biotechnology Reports, 2(2), pp. 215-224. Ahmadizad Firozjaei, S., Latifi, A., Khodi, S., Abolmaali, S., Choopani, A. A Review on Biodegradation of Toxic Organophosphate Compounds. Journal of Applied Biotechnology Reports, 2015; 2(2): 215-224. Daily, organophosphorus compounds (OPs) in human life, has found wide applications. Although OPs have biodegradability potential, they induce clinical problems in humans and other organism. Different methods are used to detoxify these compounds. In the meantime, biodegradation is preferred as a compatible way to the environment since it produces less toxic compounds. Enzymes capable to degrade the OPs are of the most important items in the biodegradation. Genetic manipulation involved in the production of these enzymes has been employed in bacteria, and finally, is used for the mass production of recombinant microorganisms. In this paper, the role of organophosphates on human life and the ways to destroy toxic organophosphates are studied.